What will we do for work and meaning when the robots take over? Free Lunch Society explores the history, and possible future, of a ‘Universal Basic Income’ and gives us a glimpse into the possible economy of tomorrow. A vital film in an era of increasing artificial intelligence and automation. An unconditional basic income means money for everyone – as a human right without service in return. How do you view universal basic income? As a visionary reform project, neoliberal axe to the roots of the social state or socially romantic left-wing utopia? Depending on the type and scope, a basic income demonstrates very different ideological visions. Which side of the coin one sees depends on one‘s own idea of humankind: inactivity as sweet poison that seduces people into laziness, or freedom from material pressures as a chance for oneself and for the community. From Alaska‘s oil fields to the Canadian prairie, from Washington‘s think tanks to the Namibian steppes, the film takes us on a grand journey and shows us what the driverless car has to do with the ideas of a German billionaire and a Swiss referendum. 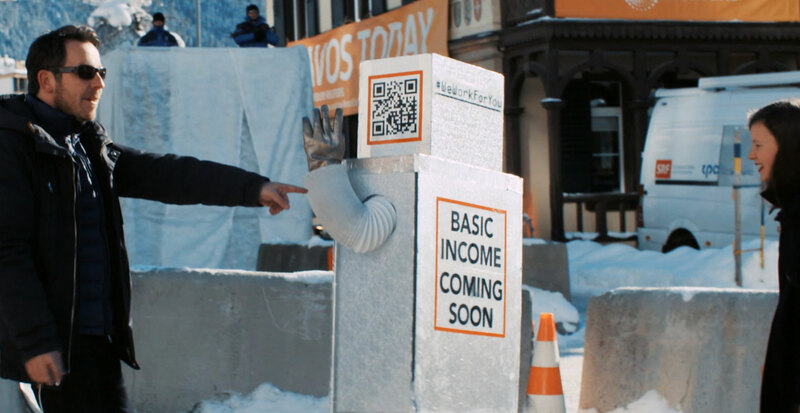 Free Lunch Society, the first international film in cinemas about basic income, is dedicated to one of the most crucial questions of our times. *This film has been exempt from classification and is restricted to people over 15 years. People under 15 must be accompanied by an adult.